For other uses, see Eusebius (disambiguation). Eusebius of Caesarea (/juːˈsiːbiəs/; Greek: Εὐσέβιος τῆς Καισαρείας, Eusébios tés Kaisareías; AD 260/265 – 339/340), also known as Eusebius Pamphili (from the Greek: Εὐσέβιος τοῦ Παμϕίλου), was a historian of Christianity, exegete, and Christian polemicist. He became the bishop of Caesarea Maritima about 314 AD. Together with Pamphilus, he was a scholar of the Biblical canon and is regarded as an extremely learned Christian of his time. He wrote Demonstrations of the Gospel, Preparations for the Gospel, and On Discrepancies between the Gospels, studies of the Biblical text. As "Father of Church History" (not to be confused with the title of Church Father), he produced the Ecclesiastical History, On the Life of Pamphilus, the Chronicle and On the Martyrs. During the Council of Antiochia (325) he was excommunicated for subscribing to the heresy of Arius, and thus withdrawn during the First Council of Nicaea where he accepted that the Homoousion referred to the Logos. Never recognized as a saint, he became counselor of Constantine the Great, and with the bishop of Nicomedia he continued to polemicize against Saint Athanasius of Alexandria, Church Fathers, since he was condemned in the First Council of Tyre in 335. Little is known about the life of Eusebius. His successor at the See of Caesarea, Acacius, wrote a Life of Eusebius, a work that has since been lost. Eusebius' own surviving works probably only represent a small portion of his total output. Beyond notices in his extant writings, the major sources are the 5th-century ecclesiastical historians Socrates, Sozomen, and Theodoret, and the 4th-century Christian author Jerome. There are assorted notices of his activities in the writings of his contemporaries Athanasius, Arius, Eusebius of Nicomedia, and Alexander of Alexandria. Eusebius' pupil, Eusebius of Emesa, provides some incidental information. In his Ecclesiastical History, Eusebius writes of Dionysius of Alexandria as his contemporary. If this is true, Eusebius' birth must have been before Dionysius' death in autumn 264; most modern scholars date the birth to some point in the five years between 260 and 265. He was presumably born in the town in which he lived for most of his adult life, Caesarea Maritima. He was baptized and instructed in the city, and lived in Syria Palaestina in 296, when Diocletian's army passed through the region (in the Life of Constantine, Eusebius recalls seeing Constantine traveling with the army). Eusebius was made presbyter by Agapius of Caesarea. Some, like theologian and ecclesiastical historian John Henry Newman, understand Eusebius' statement that he had heard Dorotheus of Tyre "expound the Scriptures wisely in the Church" to indicate that Eusebius was Dorotheus' pupil while the priest was resident in Antioch; others, like the scholar D. S. Wallace-Hadrill, deem the phrase too ambiguous to support the contention. By the 3rd century, Caesarea had a population of about 100,000. It had been a pagan city since Pompey had given control of the city to the gentiles during his command of the eastern provinces in the 60s BC. The gentiles retained control of the city for the three centuries to follow, despite Jewish petitions for joint governorship. Gentile government was strengthened by the city's refoundation under Herod the Great (r. 37–4 BC), when it had taken on the name of Augustus Caesar. In addition to the gentile settlers, Caesarea had large Jewish and Samaritan minorities. Eusebius was probably born into the Christian contingent of the city. Caesarea's Christian community presumably had a history reaching back to apostolic times, but it is a common claim that no bishops are attested for the town before about 190, even though the Apostolic Constitutions 7.46 states that Zacchaeus was the first bishop. Through the activities of the theologian Origen (185/6–254) and the school of his follower Pamphilus (later 3rd century – 309), Caesarea became a center of Christian learning. Origen was largely responsible for the collection of usage information, or which churches were using which gospels, regarding the texts which became the New Testament. The information used to create the late-fourth-century Easter Letter, which declared accepted Christian writings, was probably based on the Ecclesiastical History [HE] of Eusebius of Caesarea, wherein he uses the information passed on to him by Origen to create both his list at HE 3:25 and Origen's list at HE 6:25. Eusebius got his information about what texts were accepted by the third-century churches throughout the known world, a great deal of which Origen knew of firsthand from his extensive travels, from the library and writings of Origen. On his deathbed, Origen had made a bequest of his private library to the Christian community in the city. Together with the books of his patron Ambrosius, Origen's library (including the original manuscripts of his works[notes 1]) formed the core of the collection that Pamphilus established. Pamphilus also managed a school that was similar to (or perhaps a re-establishment of) that of Origen. Pamphilus was compared to Demetrius of Phalerum and Pisistratus, for he had gathered Bibles "from all parts of the world". Like his model Origen, Pamphilus maintained close contact with his students. Eusebius, in his history of the persecutions, alludes to the fact that many of the Caesarean martyrs lived together, presumably under Pamphilus. Soon after Pamphilus settled in Caesarea (ca. 280s), he began teaching Eusebius, who was then somewhere between twenty and twenty-five. Because of his close relationship with his schoolmaster, Eusebius was sometimes called Eusebius Pamphili: "Eusebius, son of Pamphilus". [notes 2] The name may also indicate that Eusebius was made Pamphilus' heir. Pamphilus gave Eusebius a strong admiration for the thought of Origen. Neither Pamphilus nor Eusebius knew Origen personally; Pamphilus probably picked up Origenist ideas during his studies under Pierius (nicknamed "Origen Junior") in Alexandria. In Caesarea, Origenist thought was continued in the generation after his death by Theotecnus, bishop of the city for much of the late 3rd century and an alumnus of Origen's school. Eusebius' Preparation for the Gospel bears witness to the literary tastes of Origen: Eusebius quotes no comedy, tragedy, or lyric poetry, but makes reference to all the works of Plato and to an extensive range of later philosophic works, largely from Middle Platonists from Philo to the late 2nd century. Whatever its secular contents, the primary aim of Origen and Pamphilus' school was to promote sacred learning. The library's biblical and theological contents were more impressive: Origen's Hexapla and Tetrapla; a copy of the original Aramaic version of the Gospel of Matthew; and many of Origen's own writings. Marginal comments in extant manuscripts note that Pamphilus and his friends and pupils, including Eusebius, corrected and revised much of the biblical text in their library. Their efforts made the hexaplaric Septuagint text increasingly popular in Syria and Palestine. Soon after joining Pamphilus' school, Eusebius started helping his master expand the library's collections and broaden access to its resources. At about this time Eusebius compiled a Collection of Ancient Martyrdoms, presumably for use as a general reference tool. In the 290s, Eusebius began work on his magnum opus, the Ecclesiastical History, a narrative history of the Church and Christian community from the Apostolic Age to Eusebius' own time. At about the same time, he worked on his Chronicle, a universal calendar of events from the Creation to, again, Eusebius' own time. He completed the first editions of the Ecclesiastical History and Chronicle before 300. Eusebius succeeded Agapius as Bishop of Caesarea soon after 313 and was called on by Arius who had been excommunicated by his bishop Alexander of Alexandria. An episcopal council in Caesarea pronounced Arius blameless. Eusebius, a learned man and famous author, enjoyed the favour of the Emperor Constantine. Because of this he was called upon to present the creed of his own church to the 318 attendees of the Council of Nicaea in 325." However, the anti-Arian creed from Palestine prevailed becoming the basis for the Nicene Creed. The theological views of Arius, that taught the subordination of the Son to the Father, continued to be a problem. Eustathius of Antioch strongly opposed the growing influence of Origen's theology as the root of Arianism. Eusebius, an admirer of Origen, was reproached by Eustathius for deviating from the Nicene faith. Eusebius prevailed and Eustathius was deposed at a synod in Antioch. However, Athanasius of Alexandria became a more powerful opponent and in 334, he was summoned before a synod in Caesarea (which he refused to attend). In the following year, he was again summoned before a synod in Tyre at which Eusebius of Caesarea presided. Athanasius, foreseeing the result, went to Constantinople to bring his cause before the Emperor. Constantine called the bishops to his court, among them Eusebius. Athanasius was condemned and exiled at the end of 335. Eusebius remained in the Emperor's favour throughout this time and more than once was exonerated with the explicit approval of the Emperor Constantine. After the Emperor's death (c.337), Eusebius wrote the Life of Constantine, an important historical work because of eye witness accounts and the use of primary sources. Eusebius died c.339. Much like his birth, the exact date of Eusebius' death is unknown. However, there is primary text evidence from a council held in Antioch that by the year 341, his successor Acacius had already filled the seat as Bishop. Socrates and Sozomen write about Eusebius' death, and place it just before Constantine's son Constantine II died, which was in early 340. They also say that it was after the second banishment of Athanasius, which began in mid 339. This means that his death occurred some time between the second half of 339 and early 340. Of the extensive literary activity of Eusebius, a relatively large portion has been preserved. Although posterity suspected him of Arianism, Eusebius had made himself indispensable by his method of authorship; his comprehensive and careful excerpts from original sources saved his successors the painstaking labor of original research. Hence, much has been preserved, quoted by Eusebius, which otherwise would have been lost. The literary productions of Eusebius reflect on the whole the course of his life. At first, he occupied himself with works on Biblical criticism under the influence of Pamphilus and probably of Dorotheus of Tyre of the School of Antioch. Afterward, the persecutions under Diocletian and Galerius directed his attention to the martyrs of his own time and the past, and this led him to the history of the whole Church and finally to the history of the world, which, to him, was only a preparation for ecclesiastical history. Then followed the time of the Arian controversies, and dogmatic questions came into the foreground. Christianity at last found recognition by the State; and this brought new problems—apologies of a different sort had to be prepared. Lastly, Eusebius wrote eulogies in praise of Constantine. To all this activity must be added numerous writings of a miscellaneous nature, addresses, letters, and the like, and exegetical works that extended over the whole of his life and that include both commentaries and treatises on Biblical archaeology. Eusebius' Onomasticon (more properly, On the Place-Names in the Holy Scripture, Περὶ τῶν τοπικῶν ὀνομάτων τῶν ἐν τῇ Θείᾳ Γραφῇ) is a directory of place names, or "gazetteer", a primary source that provides historical geographers with a contemporary knowledge of 4th-century Palestine and Transjordan. It sits uneasily between the ancient genres of geography and lexicography, taking elements from both but a member of neither. Eusebius' description of his own method, who wrote: "I shall collect the entries from the whole of the divinely inspired Scriptures, and I shall set them out grouped by their initial letters so that one may easily perceive what lies scattered throughout the text," implies that he had no similar type of book to work from; his work being entirely original, based only on the text of the Bible. Others have suggested that Eusebius had at his disposal early Roman maps of the Roman Empire with which to work, and which allowed him to record the precise distances between locations in Roman miles. Needless to say, this innovation has been very useful to modern research. Of the approximate 980 Biblical and N.T. names of places contained in those works, Eusebius identifies some 340 with locations known in his own day and age. The primary source for the Onomasticon is Codex Vaticanus, Gr. 1456 which dates from the 11th or 12th century. Dependent upon this manuscript is Codex Parisinus Gr 464 which dates from the 16th century. These two manuscripts were edited and published by Lagarde in 1870. Tina (Kinah, 15:22): of the tribe of Judah. Telem (15:24): of the tribe of Judah. Tessam ([Azem] 15:29): of the tribe of Judah. Tyre ([Zer] 19:35): of the tribe of Naphthali. Under each letter, the entries are organized first by the book they are found in, and then by their place in that book. In almost all of the entries in his geographical opus, Eusebius brings down the respective distances in Roman "milestones" (semeia) from major points of reference, such as from Jerusalem, Beit Gubrin (Eleutheropolis), Hebron, Ptolemais, Caesarea, etc. In Eusebius' Onomasticon, distances between each "milestone" were usually 1,600 meters–1,700 meters, although the standard Roman mile was 1,475 meters. Since most villages in the Onomasticon are far removed from Roman-built roads, scholars have concluded that Eusebius did not glean the geographical information from maps based on a milestone survey, but rather collected the information from some other source. Where there is a contemporary town at the site or nearby, Eusebius notes it in the corresponding entry. "Terebinth", for example, describes Shechem as "near Neapolis", modern Nablus, and "Tophet" is located "in the suburbs of Jerusalem". The Onomasticon has traditionally been dated before 324, on the basis of its sparse references to Christianity, and complete absence of remarks on Constantine's buildings in the Holy Land. The work also describes traditional religious practices at the oak of Mamre as though they were still happening, while they are known to have been suppressed soon after 325, when a church was built on the site. Eusebius references to the encampment of the Legio X Fretensis at Aila (in southern Israel, near modern Aqaba and Eilat); the X Fretensis was probably transferred from Jerusalem to Aila under Diocletian. Eusebius compiled his work in Greek, although a Latin translation of the Onomasticon was made by Jerome about a century later. Pamphilus and Eusebius occupied themselves with the textual criticism of the Septuagint text of the Old Testament and especially of the New Testament. An edition of the Septuagint seems to have been already prepared by Origen, which, according to Jerome, was revised and circulated by Eusebius and Pamphilus. For an easier survey of the material of the four Evangelists, Eusebius divided his edition of the New Testament into paragraphs and provided it with a synoptical table so that it might be easier to find the pericopes that belong together. These canon tables or "Eusebian canons" remained in use throughout the Middle Ages, and illuminated manuscript versions are important for the study of early medieval art, as they are the most elaborately decorated pages of many Gospel books. Eusebius detailed in Epistula ad Carpianum how to use his canons. The Chronicle (Παντοδαπὴ Ἱστορία (Pantodape historia)) is divided into two parts. The first part, the Chronography (Χρονογραφία (Chronographia)), gives an epitome of universal history from the sources, arranged according to nations. The second part, the Canons (Χρονικοὶ Κανόνες (Chronikoi kanones)), furnishes a synchronism of the historical material in parallel columns, the equivalent of a parallel timeline. The work as a whole has been lost in the original Greek, but it may be reconstructed from later chronographists of the Byzantine school who made excerpts from the work, especially George Syncellus. The tables of the second part have been completely preserved in a Latin translation by Jerome, and both parts are still extant in an Armenian translation. The loss of the Greek originals has given the Armenian translation a special importance; thus, the first part of Eusebius' Chronicle, of which only a few fragments exist in the Greek, has been preserved entirely in Armenian, though with lacunae. The Chronicle as preserved extends to the year 325. In his Church History or Ecclesiastical History, Eusebius wrote the first surviving history of the Christian Church as a chronologically-ordered account, based on earlier sources, complete from the period of the Apostles to his own epoch. The time scheme correlated the history with the reigns of the Roman Emperors, and the scope was broad. Included were the bishops and other teachers of the Church, Christian relations with the Jews and those deemed heretical, and the Christian martyrs through 324. Although its accuracy and biases have been questioned, it remains an important source on the early church due to Eusebius's access to materials now lost. Eusebius' Life of Constantine (Vita Constantini) is a eulogy or panegyric, and therefore its style and selection of facts are affected by its purpose, rendering it inadequate as a continuation of the Church History. As the historian Socrates Scholasticus said, at the opening of his history which was designed as a continuation of Eusebius, "Also in writing the life of Constantine, this same author has but slightly treated of matters regarding Arius, being more intent on the rhetorical finish of his composition and the praises of the emperor, than on an accurate statement of facts." The work was unfinished at Eusebius' death. Some scholars have questioned the Eusebian authorship of this work. Of the life of Pamphilus, only a fragment survives. A work on the martyrs of Palestine in the time of Diocletian was composed after 311; numerous fragments are scattered in legendaries which have yet to be collected. The life of Constantine was compiled after the death of the emperor and the election of his sons as Augusti (337). It is more a rhetorical eulogy on the emperor than a history but is of great value on account of numerous documents incorporated in it. A treatise against Hierocles (a Roman governor), in which Eusebius combated the former's glorification of Apollonius of Tyana in a work entitled A Truth-loving Discourse (Greek: Philalethes logos); in spite of manuscript attribution to Eusebius, however, it has been argued (by Thomas Hagg and more recently, Aaron Johnson that this treatise "Against Hierocles" was written by someone other than Eusebius of Caesarea. Praeparatio evangelica (Preparation for the Gospel), commonly known by its Latin title, which attempts to prove the excellence of Christianity over every pagan religion and philosophy. The Praeparatio consists of fifteen books which have been completely preserved. Eusebius considered it an introduction to Christianity for pagans. But its value for many later readers is more because Eusebius studded this work with so many lively fragments from historians and philosophers which are nowhere else preserved. Here alone is preserved Pyrrho's translation of the Buddhist Three marks of existence upon which Pyrrho based Pyrrhonism. Here alone is a summary of the writings of the Phoenician priest Sanchuniathon of which the accuracy has been shown by the mythological accounts found on the Ugaritic tables. Here alone is the account from Diodorus Siculus's sixth book of Euhemerus' wondrous voyage to the island of Panchaea where Euhemerus purports to have found his true history of the gods. And here almost alone is preserved writings of the neo-Platonist philosopher Atticus along with so much else. Another work which originated in the time of the persecution, entitled Prophetic Extracts (Eclogae propheticae). It discusses in four books the Messianic texts of Scripture. The work is merely the surviving portion (books 6–9) of the General elementary introduction to the Christian faith, now lost. The fragments given as the Commentary on Luke in the PG have been claimed to derive from the missing tenth book of the General Elementary Introduction see D. S. Wallace-Hadrill); however, Aaron Johnson has argued that they cannot be associated with this work. The treatise On Divine Manifestation or On the Theophania (Peri theophaneias), of unknown date. It treats of the incarnation of the Divine Logos, and its contents are in many cases identical with the Demonstratio evangelica. Only fragments are preserved in Greek, but a complete Syriac translation of the Theophania survives in an early 5th-century manuscript. Samuel Lee, the editor (1842) and translator (1843) of the Syriac Theophania thought that the work must have been written "after the general peace restored to the Church by Constantine, and before either the 'Praeparatio,' or the 'Demonstratio Evengelica,' was written . . . it appears probable . . . therefore, that this was one of the first productions of Eusebius, if not the first after the persecutions ceased." Hugo Gressmann, noting in 1904 that the Demonstratio seems to be mentioned at IV. 37 and V. 1, and that II. 14 seems to mention the extant practice of temple prostitution at Hieropolis in Phoenica, concluded that the Theophania was probably written shortly after 324. Others have suggested a date as late as 337. A supplement to the last-named work, also against Marcellus, entitled Ecclesiastical Theology, in which he defended the Nicene doctrine of the Logos against the party of Athanasius. A number of writings, belonging in this category, have been entirely lost. An enormous Commentary on the Psalms. A commentary on Isaiah, discovered more or less complete in a manuscript in Florence early in the 20th century and published 50 years later. Small fragments of commentaries on Romans and 1 Corinthians. Eusebius also wrote a work Quaestiones ad Stephanum et Marinum, "On the Differences of the Gospels" (including solutions). This was written for the purpose of harmonizing the contradictions in the reports of the different Evangelists. This work was recently (2011) translated into the English language by David J. Miller and Adam C. McCollum (edited by Roger Pearse) and was published under the name "Eusebius of Caesarea: Gospel Problems and Solutions." The original work was also translated into Syriac, and lengthy quotations exist in a catena in that language, and also in Coptic and Arabic catenas. A plan of Jerusalem and the Temple of Solomon. These three treatises have been lost. The addresses and sermons of Eusebius are mostly lost, but some have been preserved, e.g., a sermon on the consecration of the church in Tyre and an address on the thirtieth anniversary of the reign of Constantine (336). Most of Eusebius' letters are lost. His letters to Carpianus and Flacillus exist complete. Fragments of a letter to the empress Constantia also exists. From a dogmatic point of view, Eusebius stands entirely upon the shoulders of Origen. Like Origen, he started from the fundamental thought of the absolute sovereignty (monarchia) of God. God is the cause of all beings. But he is not merely a cause; in him everything good is included, from him all life originates, and he is the source of all virtue. God sent Christ into the world that it may partake of the blessings included in the essence of God. Christ is God and is a ray of the eternal light; but the figure of the ray is so limited by Eusebius that he expressly distinguishes the Son as distinct from Father as a ray is also distinct from its source the sun. Eusebius was intent upon emphasizing the difference of the persons of the Trinity and maintaining the subordination of the Son (Logos, or Word) to God. The Logos, the Son (Jesus) is an hypostasis of God the Father whose generation, for Eusebius, took place before time. The Logos acts as the organ or instrument of God, the creator of life, the principle of every revelation of God, who in his absoluteness and transcendence is enthroned above and isolated from all the world. Eusebius, with most of the Christian tradition, assumed God was immutable. Therefore, to Eusebius's mind, the Logos must possess divinity by participation (and not originally like the Father), so that he can change, unlike God the Father. Thus he assumed a human body without altering the immutable divine Father. Eusebius never calls Jesus o theós, but theós because in all contrary attempts he suspected either polytheism (three distinct gods) or Sabellianism (three modes of one divine person). Likewise, Eusebius described the relation of the Holy Spirit within the Trinity to that of the Son to the Father. No point of this doctrine is original with Eusebius, all is traceable to his teacher Origen. The lack of originality in his thinking shows itself in the fact that he never presented his thoughts in a system. After nearly being excommunicated due to charges of heresy by Alexander of Alexandria, Eusebius submitted and agreed to the Nicene Creed at the First Council of Nicea in 325. Eusebius held that men were sinners by their own free choice and not by the necessity of their natures. Eusebius said, "The Creator of all things has impressed a natural law upon the soul of every man, as an assistant and ally in his conduct, pointing out to him the right way by this law; but, by the free liberty with which he is endowed, making the choice of what is best worthy of praise and acceptance, because he has acted rightly, not by force, but from his own free-will, when he had it in his power to act otherwise, As, again, making him who chooses what is worst, deserving of blame and punishment, as having by his own motion neglected the natural law, and becoming the origin and fountain of wickedness, and misusing himself, not from any extraneous necessity, but from free will and judgment. The fault is in him who chooses, not in God. For God has not made nature or the substance of the soul bad; for he who is good can make nothing but what is good. Everything is good which is according to nature. Every rational soul has naturally a good free-will, formed for the choice of what is good. But when a man acts wrongly, nature is not to be blamed; for what is wrong, takes place not according to nature, but contrary to nature, it being the work of choice, and not of nature". By the time of the Byzantine Iconoclasm several centuries later, Eusebius had unfairly gained the reputation of having been an Arian, and was roundly condemned as such by Patriarch Nikephoros I of Constantinople. A letter Eusebius is supposed to have written to Constantine's daughter Constantia, refusing to fulfill her request for images of Christ, was quoted in the decrees (now lost) of the Iconoclast Council of Hieria in 754, and later quoted in part in the rebuttal of the Hieria decrees in the Second Council of Nicaea of 787, now the only source from which some of the text is known. The authenticity, or authorship of the letter remain uncertain. Edward Gibbon openly distrusted the writings of Eusebius concerning the number of martyrs, by noting a passage in the shorter text of the Martyrs of Palestine attached to the Ecclesiastical History (Book 8, Chapter 2) in which Eusebius introduces his description of the martyrs of the Great Persecution under Diocletian with: "Wherefore we have decided to relate nothing concerning them except the things in which we can vindicate the Divine judgment. [...] We shall introduce into this history in general only those events which may be useful first to ourselves and afterwards to posterity." In the longer text of the same work, chapter 12, Eusebius states: "I think it best to pass by all the other events which occurred in the meantime: such as [...] the lust of power on the part of many, the disorderly and unlawful ordinations, and the schisms among the confessors themselves; also the novelties which were zealously devised against the remnants of the Church by the new and factious members, who added innovation after innovation and forced them in unsparingly among the calamities of the persecution, heaping misfortune upon misfortune. I judge it more suitable to shun and avoid the account of these things, as I said at the beginning." When his own honesty was challenged by his contemporaries, Gibbon appealed to a chapter heading in Eusebius' Praeparatio evangelica (Book XII, Chapter 31) in which Eusebius discussed "That it will be necessary sometimes to use falsehood as a remedy for the benefit of those who require such a mode of treatment." Although Gibbon refers to Eusebius as the 'gravest' of the ecclesiastical historians, he also suggests that Eusebius was more concerned with the passing political concerns of his time than his duty as a reliable historian. Jacob Burckhardt (19th century cultural historian) dismissed Eusebius as "the first thoroughly dishonest historian of antiquity". Other critics of Eusebius' work cite the panegyrical tone of the Vita, plus the omission of internal Christian conflicts in the Canones, as reasons to interpret his writing with caution. With reference to Gibbon's comments, Joseph Barber Lightfoot (late 19th century theologian and former Bishop of Durham) pointed out that Eusebius' statements indicate his honesty in stating what he was not going to discuss, and also his limitations as a historian in not including such material. He also discusses the question of accuracy. "The manner in which Eusebius deals with his very numerous quotations elsewhere, where we can test his honesty, is a sufficient vindication against this unjust charge." Lightfoot also notes that Eusebius cannot always be relied on: "A far more serious drawback to his value as a historian is the loose and uncritical spirit in which he sometimes deals with his materials. This shows itself in diverse ways. He is not always to be trusted in his discrimination of genuine and spurious documents." Averil Cameron (professor at King's College and Oxford) and Stuart Hall (historian and theologian), in their recent translation of the Life of Constantine, point out that writers such as Burckhardt found it necessary to attack Eusebius in order to undermine the ideological legitimacy of the Habsburg empire, which based itself on the idea of Christian empire derived from Constantine, and that the most controversial letter in the Life has since been found among the papyri of Egypt. In Church History (Vol. 59, 1990), Michael J. Hollerich (assistant professor at the Jesuit Santa Clara University, California) replies to Burckhardt's criticism of Eusebius, that "Eusebius has been an inviting target for students of the Constantinian era. At one time or another they have characterized him as a political propagandist, a good courtier, the shrewd and worldly adviser of the Emperor Constantine, the great publicist of the first Christian emperor, the first in a long succession of ecclesiastical politicians, the herald of Byzantinism, a political theologian, a political metaphysician, and a caesaropapist. It is obvious that these are not, in the main, neutral descriptions. Much traditional scholarship, sometimes with barely suppressed disdain, has regarded Eusebius as one who risked his orthodoxy and perhaps his character because of his zeal for the Constantinian establishment." Hollerich concludes that "... the standard assessment has exaggerated the importance of political themes and political motives in Eusebius's life and writings and has failed to do justice to him as a churchman and a scholar". While many have shared Burckhardt's assessment, particularly with reference to the Life of Constantine, others, while not pretending to extol his merits, have acknowledged the irreplaceable value of his works which may principally reside in the copious quotations that they contain from other sources, often lost. Migne, J.P., ed. Eusebiou tou Pamphilou, episkopou tes en Palaistine Kaisareias ta euriskomena panta (in Greek). Patrologia Graeca 19–24. Paris, 1857. Online at Khazar Skeptik and Documenta Catholica Omnia. Accessed 4 November 2009. McGiffert, Arthur Cushman, trans. Church History. From Nicene and Post-Nicene Fathers, Second Series, Vol. 1. Edited by Philip Schaff and Henry Wace. Buffalo, NY: Christian Literature Publishing Co., 1890. Revised and edited for New Advent by Kevin Knight. Online at New Advent and CCEL. Accessed 28 September 2009. Williamson, G.A., trans. Church History. London: Penguin, 1989. Onomasticon (On the Place-Names in Holy Scripture). Klostermann, E., ed. Eusebius' Werke 3.1 (Die griechischen christlichen Schrifsteller der ersten (drei) Jahrhunderte 11.1. Leipzig and Berlin, 1904). Online at the Internet Archive. Accessed 29 January 2010. Wolf, Umhau, trans. The Onomasticon of Eusebius Pamphili: Compared with the version of Jerome and annotated. Washington, D.C.: Catholic University of America Press, 1971. Online at Tertullian. Accessed 29 January 2010. Taylor, Joan E., ed. Palestine in the Fourth Century. The Onomasticon by Eusebius of Caesarea, translated by Greville Freeman-Grenville, and indexed by Rupert Chapman III (Jerusalem: Carta, 2003). De Martyribus Palestinae (On the Martyrs of Palestine). McGiffert, Arthur Cushman, trans. Martyrs of Palestine. From Nicene and Post-Nicene Fathers, Second Series, Vol. 1. Edited by Philip Schaff and Henry Wace. Buffalo, NY: Christian Literature Publishing Co., 1890. Revised and edited for New Advent by Kevin Knight. Online at New Advent and CCEL. Accessed June 9, 2009. Cureton, William, trans. History of the Martyrs in Palestine by Eusebius of Caesarea, Discovered in a Very Antient Syriac Manuscript. London: Williams & Norgate, 1861. Online at Tertullian. Accessed September 28, 2009. Praeparatio Evangelica (Preparation for the Gospel). Demonstratio Evangelica (Demonstration of the Gospel). Laudes Constantini (In Praise of Constantine) 335. Migne, J.P., ed. Eusebiou tou Pamphilou, episkopou tes en Palaistine Kaisareias ta euriskomena panta (in Greek). Patrologia Graeca 19–24. Paris, 1857. Online at Khazar Skeptik. Accessed 4 November 2009. Richardson, Ernest Cushing, trans. Oration in Praise of Constantine. From Nicene and Post-Nicene Fathers, Second Series, Vol. 1. Edited by Philip Schaff and Henry Wace. Buffalo, NY: Christian Literature Publishing Co., 1890. Revised and edited for New Advent by Kevin Knight. Online at New Advent. Accessed 19 October 2009. Richardson, Ernest Cushing, trans. Life of Constantine. From Nicene and Post-Nicene Fathers, Second Series, Vol. 1. Edited by Philip Schaff and Henry Wace. Buffalo, NY: Christian Literature Publishing Co., 1890. Revised and edited for New Advent by Kevin Knight. Online at New Advent. Accessed 9 June 2009. Cameron, Averil and Stuart Hall, trans. Life of Constantine. New York: Oxford University Press, 1999. Salmond, S.D.F., trans. From Ante-Nicene Fathers, Vol. 6. Edited by Alexander Roberts, James Donaldson, and A. Cleveland Coxe. Buffalo, NY: Christian Literature Publishing Co., 1886. Revised and edited for New Advent by Kevin Knight. Online at New Advent. Accessed 31 January 2010. Fotheringham, John Knight, ed. The Bodleian Manuscript of Jerome's Version of the Chronicle of Eusebius. Oxford: Clarendon, 1905. Online at the Internet Archive. Accessed 8 October 2009.
de Viris Illustribus (On Illustrious Men) 392. Herding, W., ed. De Viris Illustribus (in Latin). Leipzig: Teubner, 1879. Online at Internet Archive. Accessed 6 October 2009. Liber de viris inlustribus (in Latin). Texte und Untersuchungen 14. Leipzig, 1896. Fremantle, W.H., G. Lewis and W.G. Martley, trans. Letters. From Nicene and Post-Nicene Fathers, Second Series, Vol. 6. Edited by Philip Schaff and Henry Wace. Buffalo, NY: Christian Literature Publishing Co., 1893. Revised and edited for New Advent by Kevin Knight. Online at New Advent and CCEL. Accessed 19 October 2009. De Principiis (On First Principles). ^ Pamphilus might not have obtained all of Origen's writings, however: the library's text of Origen's commentary on Isaiah broke off at 30:6, while the original commentary was said to have taken up thirty volumes. ^ There are three interpretations of this term: (1) that Eusebius was the "spiritual son", or favored pupil, of Pamphilus; (2) that Eusebius was literally adopted by Pamphilus; and (3) that Eusebius was Pamphilus' biological son. The third explanation is the least popular among scholars. The scholion on the Preparation for the Gospels 1.3 in the Codex Paris. 451 is usually adduced in support of the thesis. Most reject the scholion as too late or misinformed, but E. H. Gifford, an editor and translator of the Preparation, believes it to have been written by Arethas, the tenth-century archbishop of Caesarea, who was in a position to know the truth of the matter. ^ "Eusebius of Cesarea in the Treccani Encyclopedia online" (in Italian). ^ Barnes, Constantine and Eusebius, 277; Wallace-Hadrill, 7; Quasten dates his birth to "about 263" (3.309). ^ Louth, "Birth of church history", 266; Quasten, 3.309. ^ a b Wallace-Hadrill, 12, citing Socrates, Historia Ecclesiastica 1.8; Theodoret, Historia Ecclesiastica 1.11. ^ Wallace-Hadrill, 12, citing Vita Constantini 1.19. ^ Eusebius, Ecclesiastical History 7.32.4, qtd. and tr. D. S. Wallace-Hadrill, 12; Wallace-Hadrill cites J. H. Newman, The Arians of the Fourth Century (1890), 262, in 12 n. 4. ^ Barnes, Constantine and Eusebius, 81–82; cf. also A. H. M. Jones, The Cities of the Eastern Roman Provinces (Oxford: Clarendon, 1937), 273–74. ^ Acts 8:40, 10:1–48; Barnes, Constantine and Eusebius, 82, 327 n. 11. ^ Barnes, Constantine and Eusebius, 82. ^ C.G. Bateman, Origen’s Role in the Formation of the New Testament Canon, 2010. ^ Eusebius, Historia Ecclesiastica 6.32.3–4; Kofsky, 12. ^ Barnes, Constantine and Eusebius, 333 n. 114, citing Eusebius, HE 6.32.1; In Is. p. 195.20–21 Ziegler. ^ Eusebius, Historia Ecclesiastica 6.32.3–4; Barnes, Constantine and Eusebius, 93; idem., "Eusebius of Caesarea", 2 col. 2. ^ Kofsky, 12, citing Eusebius, Historia Ecclesiastica 7.32.25. On Origen's school, see: Gregory, Oratio Panegyrica; Kofsky, 12–13. ^ a b c d e Barnes, Constantine and Eusebius, 94. ^ Wallace-Hadrill, 12 n. 1. ^ Barnes, Constantine and Eusebius, 93, 95; Louth, "Birth of church history", 266. ^ Jerome, de Viris Illustribus 76, qtd. and tr. Louth, "Birth of church history", 266. ^ Barnes, Constantine and Eusebius, 93, 95. ^ Barnes, Constantine and Eusebius, 93. ^ Barnes, Constantine and Eusebius, 93–94. ^ Barnes, Constantine and Eusebius, 95. ^ Barnes, Constantine and Eusebius, 277; Wallace-Hadrill, 12–13. ^ Vermes, Geza (2012). Christian Beginnings from Nazareth to Nicea. Allen Lane the Penguin Press. p. 228. ^ Walker, Williston (1959). "A History of the Christian Church". Edinburgh: T&T Clark: 108. ^ Bruce L. Shelley, Church History in Plain Language, (2nd ed. Dallas, Texas: Word Publishing, 1995. ), p.102. ^ Colm Luibheid, The Essential Eusebius : The Story of the First Centuries of the Christian Church in the Words of Its Greatest Historian, Mentor-Omega Press, 1966, p 31. ^ Schaff, Philip and Rev. Arthur Cushman McGiffert, Ph.D. Eusebius Pamphilius: Church History, Life of Constantine, Oration in Praise of Constantine. Grand Rapids, MI: Christian Classics Ethereal Library, (1890). 27. ^ Barnes, Constantine and Eusebius, 106. ^ Onomasticon p. 2.14ff., qtd. and tr. Barnes, Constantine and Eusebius, 107. ^ Barnes, Constantine and Eusebius, 106–7. ^ a b Barnes, Constantine and Eusebius, 107. ^ Barnes, "Onomasticon", 413 n. 4. ^ Barnes, Constantine and Eusebius, 112. ^ Barnes, Constantine and Eusebius, 112–13, 340 n. 58. ^ See, e.g., James the Brother of Jesus (book) by Robert Eisenman. ^ Eusebius, Bishop of Caesarea On the Theophania, or Divine Manifestation of Our Lord and Saviour Jesus Christ (Cambridge, 1843), pp. xxi–xxii. Lee's full passage is as follows: "As to the period at which it was written, I think it must have been, after the general peace restored to the Church by Constantine, and before either the "Praeparatio", or the "Demonstratio Evangelica", was written. My reason for the first of these suppositions is: Our author speaks repeatedly of the peace restored to the Church; of Churches and Schools restored, or then built for the first time : of the nourishing state of the Church of Caesarea; of the extended, and then successfully extending, state of Christianity : all of which could not have been said during the times of the last, and most severe persecution. My reasons for the second of these suppositions are, the considerations that whatever portions of this Work are found, either in the "Praeparatio", |22 the "Demonstratio Evangelica", or the " Oratio de laudibus Constantini", they there occur in no regular sequence of argument as they do in this Work: especially in the latter, into which they have been carried evidently for the purpose of lengthening out a speech. Besides, many of these places are amplified in these works, particularly in the two former as remarked in my notes; which seems to suggest, that such additions were made either to accommodate these to the new soil, into which they had been so transplanted, or, to supply some new matter, which had suggested itself to our author. And again, as both the "Praeparatio" and "Demonstratio Evangelica", are works which must have required very considerable time to complete them, and which would even then be unfit for general circulation ; it appears probable to me, that this more popular, and more useful work, was first composed and published, and that the other two,--illustrating as they generally do, some particular points only,--argued in order in our Work,-- were reserved for the reading and occasional writing of our author during a considerable number of years, as well for the satisfaction of his own mind, as for the general reading of the learned. It appears probable to me therefore, that this was one of the first productions of Eusebius, if not the first after the persecutions ceased." ^ Barnes, Constantine and Eusebius (Harvard, 1981), p. 367, n.176. Note that Lee (p. 285) thinks that the passage in V. 1 refers to an earlier section within the Theophania itself, rather than to the Demonstratio. ^ Caesaea, Eusebius of; Miller, David J. D.; McCollum, Adam C.; Downer, Carol; Zamagni, Claudio (2010-03-06). Eusebius of Caesarea: Gospel Problems and Solutions (Ancient Texts in Translation): Roger Pearse, David J Miller, Adam C McCollum: 9780956654014: Amazon.com: Books. ISBN 978-0956654014. ^ David M. Gwynn, "From Iconoclasm to Arianism: The Construction of Christian Tradition in the Iconoclast Controversy" [Greek, Roman, and Byzantine Studies 47 (2007) 225–251], p. 227-245. ^ See Gibbon's Vindication for examples of the accusations that he faced. ^ "Eusebius of Caesarea: Praeparatio Evangelica (translated by E.H. Gifford)". tertullian.org. Retrieved 2013-03-04. ^ "Data for discussing the meaning of pseudos and Eusebius in PE XII, 31". tertullian.org. Retrieved 2008-02-01. ^ Burgess, R. W., and Witold Witakowski. 1999. Studies in Eusebian and Post-Eusebian chronography 1. The "Chronici canones" of Eusebius of Caesarea: structure, content and chronology, AD 282–325 – 2. The "Continuatio Antiochiensis Eusebii": a chronicle of Antioch and the Roman Near East during the Reigns of Constantine and Constantius II, AD 325–350. Historia (Wiesbaden, Germany), Heft 135. Stuttgart: Franz Steiner. Page 69. ^ "J.B. Lightfoot, Eusebius of Caesarea". 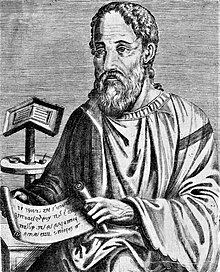 tertullian.org. Retrieved 2008-02-01. Barnes, Timothy D. (1981). Constantine and Eusebius. Cambridge, MA: Harvard University Press. ISBN 978-0-674-16530-4. Eusebius (1999). Life of Constantine. Averil Cameron and Stuart G. Hall, trans. Oxford: Clarendon Press. ISBN 978-0-19-814924-8. Drake, H. A. (2002). Constantine and the bishops the policy of intolerance. Baltimore: Johns Hopkins Press. ISBN 978-0-8018-7104-7. Kofsky, Aryeh (2000). Eusebius of Caesarea against paganism. Leiden: Brill. ISBN 978-90-04-11642-9. Lawlor, Hugh Jackson (1912). Eusebiana: essays on the Ecclesiastical history of Eusebius, bishop of Caesarea. Oxford: Clarendon Press. Levine, Lee I. (1975). Caesarea under Roman rule. Leiden: Brill. ISBN 978-90-04-04013-7. Louth, Andrew (2004). "Eusebius and the Birth of Church History". In Young, Frances; Ayres, Lewis; Louth, Andrew (eds.). The Cambridge history of early Christian literature. Cambridge: Cambridge Univ. Press. pp. 266–274. ISBN 978-0-521-46083-5. Momigliano, Arnaldo (1989). On pagans, Jews, and Christians. Middletown, CT: Wesleyan University Press. ISBN 978-0-8195-6218-0. Newman, John Henry (1890). The Arians of the Fourth Century (7th ed.). London: Longmans, Green and Co.
Sabrina Inowlocki & Claudio Zamagni (eds), Reconsidering Eusebius: Collected papers on literary, historical, and theological issues (Leiden, Brill, 2011) (Vigiliae Christianae, Supplements, 107). Wallace-Hadrill, D. S. (1960). Eusebius of Caesarea. London: A. R. Mowbray. Attridge, Harold W.; Hata, Gohei, eds. (1992). Eusebius, Christianity, and Judaism. Detroit: Wayne State Univ. Press. ISBN 978-0-8143-2361-8. Chesnut, Glenn F. (1986). The first Christian histories : Eusebius, Socrates, Sozomen, Theodoret, and Evagrius (2nd ed.). Macon, GA: Mercer University Press. ISBN 978-0-86554-164-1. Drake, H. A. (1976). In praise of Constantine : a historical study and new translation of Eusebius' Tricennial orations. Berkeley: University of California Press. ISBN 978-0-520-09535-9. Eusebius (1984). The History of the Church from Christ to Constantine. G.A. Williamson, trans. New York: Dorset Press. ISBN 978-0-88029-022-7. Grant, Robert M. (1980). Eusebius as Church Historian. Oxford: Clarendon Pr. ISBN 978-0-19-826441-5. Valois, Henri de (1833). "Annotations on the Life and Writings of Eusebius Pamphilus". The Ecclesiastical History of Eusebius Pamphilus. S. E. Parker, trans. Philadelphia: Davis. Church History (Eusebius) ; The Life of Constantine (Eusebius), online at ccel.org. History of the Martyrs in Palestine (Eusebius), English translation (1861) William Cureton. Website tertullian.org.